Initial Phase: This phase is intended as an acclimation period for the resident into the SCO clinical program, and may be very short in duration for residents who are SCO graduates. The resident will focus on becoming oriented to The Eye Center at SCO’s (TEC) layout, policies, procedures, clinic forms, and electronic health records, in addition to understanding coding & billing and proper chart documentation. The resident will also become acquainted with the administrative and professional staff at TEC, its medical physicians, and learn its referral networks. The resident will begin direct patient care and will discuss each case, including case management, with the residency supervisor (or a designated SCO Faculty/Adjunct Faculty Member). The residency supervisor or another designated faculty member must be physically accessible to the resident at any clinical location in which patient care is provided. 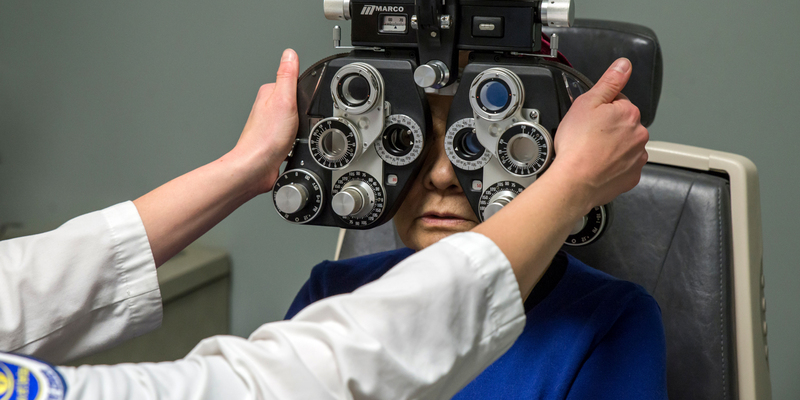 Additionally, the resident will be expected to learn to independently and accurately operate all relevant (as designated by the program supervisor) ophthalmic instruments in TEC. In addition to providing direct patient care, the resident will begin to serve in TEC’s on-call rotation with a residency supervisor physically present at each on-call encounter. At no time during Phase I will a resident examine an on-call patient or take part in patient care outside of TEC without the physical presence of a residency supervisor or the supervisor’s designee, who must be another SCO faculty member. To advance to the next Phase the resident must complete the initial orientation to TEC and demonstrate to the supervisor’s satisfaction that he/she is functioning at professional entry-level competence and is becoming familiar with TEC operations. In addition, the resident will begin training in advanced procedures pertinent to the residency program emphasis (e.g. IVFA, foreign body removal). The residency supervisor or another designated faculty member must be physically accessible to the resident at the clinical location. It is anticipated that this Initial Phase will last approximately 3 months for most residents, but as noted the length of time in any phase is solely dependent on demonstrated competence. To advance to the next Phase the resident must demonstrate acceptable progress in the supervisor’s judgment toward mastering procedures and cognitive tasks that will enable the resident to attain advanced clinical competency. Should the resident’s progression through the Initial Phase be slower than anticipated, remediation will be considered at or around the fourth month. Intermediate Phase: The resident will be given increased autonomy in patient care. With regard to the on-call service the resident may perform initial triage and examine patients as necessary but must telephone the residency supervisor (or their designee) regarding each case in order to ensure standard of care has been met. The residency supervisor must make the ultimate decision that a patient’s symptoms do not designate an emergency appointment if a patient will not be examined after hours. The residency supervisor (or their designee) must be physically available to the resident for consultation. Feedback will be provided to the resident as necessary. The residency supervisor or designated faculty member will be physically or remotely accessible at all of the resident’s clinical assignments during this phase. The accessibility level will be determined by the Residency Supervisor and based upon the clinical competency of the Resident. Competence will be expected in advanced procedures learned in the prior Phase. To advance to the next Phase the resident must demonstrate to the supervisor’s satisfaction the ability to successfully manage advanced clinical cases. Residents are expected to complete this phase by or before the midpoint of the program. Should the resident not be ready to transition to the Final Phase by the midpoint of the program, remediation (see below) will be considered. Final Phase: This phase will typically be instituted midway into each program. The resident will be given full autonomy with regard to patient care. When appropriate, the resident will also be given opportunities to precept student interns and assist in laboratory student instruction. The resident will be fully autonomous with respect to the on-call service and patient care outside of TEC but will have remote accessibility to the residency supervisor as needed or requested. With regard to student intern precepting in TEC, the resident will work alongside the residency supervisor (or their designee) until which time they are deemed competent to independently oversee and educate students. Competency includes the ability to oversee multiple students and their patients simultaneously and possess the ability to make clinical decisions based upon student data collection. Once deemed fully competent by the residency supervisor and exposed to this opportunity, the resident can begin to precept students independently to the degree they are comfortable. The goal of SCO’s Residency Programs is that all residents will successfully complete this Final Phase, being fully independent and autonomous in all aspects of patient care, by the completion of the Residency Program. In the event that the Resident is unable to progress through the Initial Phase or the Intermediate Phase in the expected time period, or if the resident is unable to perform at the level expected when reaching the Final Phase, remediation, as described in the Residency Handbook, will be implemented.